These are skincare tips for the jet setter. We are all about preventing dehydration while travelling and as you know our approach to most skin related problems is proactive. While travelling, start by drinking lots of water, which also helps you avoid catching any colds. The other half of the equation has to do with using the right products to give your skin the boost it needs to survive the sahara like conditions of an aircraft (that's a fact-it's dryer actually). In addition to our travel skincare beauty routine you will find some other products you might want along your journey. We put our best tips together for the first scoop readers. We are thrilled to be collaborating with them. Keep an eye out for new amazing content like our matcha smoothie! Basically a spa treatment at home (we suggest a fluffy bath robe and some cucumbers!). You should always do a deep moisturizing mask either the night before or the day of your scheduled travel. We suggest the Dermalogica Skin Hydrating Masque which is great for all skin types since it’s extremely gentle. We love this one because it’s a gel mask that cools and calms your skin leaving you with a silky complexion. It’s oil-free and packed with vitamin C and E, so it will hydrate your skin for the long haul. Lavender and lemon Lysol wipes are our favorite but any brand will do. These little packs are travel sized and smell delicious so get ready to share with your neighbor on board. Bacteria and dirt are among the biggest enemies of great skin. When you board an aircraft there are many areas that the cleaning crew does not have sufficient time to disinfect and we suggest that the first thing that you do after you are settled in your seat is to wipe the following areas. (1) The control panel for the onboard entertainment system. Depending on the aircraft you are flying this can either be in your seat or it can be a touch screen. Wipe carefully – not once but twice. (2) Your tray table. Trust us when we tell you that this is never wiped. It is a breeding ground for bacteria. (3) The buttons for the lights and the lever for the seat. You can buy these online or at your local Homedepot or Walmart etc. You can also get similar wipes from Clorox, Purell, or even Wet Ones. Start the day with a few extra glasses of water in preparation for the sky-high dry environment. Next, apply your Ordinary Buffet Serum twice (available online here), and pack it in your carry-on for reapplication during your flight. Don’t worry, it’s a travel friendly size and passes all TSA liquid travel regulations. The Ordinary Buffet Serum is a multi-technology peptide serum and has hyaluronic acid in it. It absorbs quickly and makes your skin feel unimaginably touchable and soft (think velvet!). On a long flight we re-apply the serum every 2-3 hours. The Ordinary also has a hyaluronic acid and B5 vitamin serum that is equally amazing. Pop Sugar recently wrote and article on it called 'The 7 Dollar Face Serum that Saved my Dried Out Winter Skin'. After using your Ordinary Buffet serum, apply a broad-spectrum SPF of 30 or higher. This Neutrogena one truly is breakout free and absorbs very fast. Why apply sunscreen you ask? Because you will be 36,000 feet closer to the UV rays than you were on the ground, and no, the window glass doesn’t protect you! A 2015 study by the National Institute of Health found that pilots and cabin crew have approximately twice the incidence of melanoma compared to the general population. That’s no joke! We apply the Neutrogena Clear Face SPF 30, which is lightweight and doesn’t leave your face feeling greasy. Plus, it’s oil and fragrance free. Once you’ve protected your skin from damaging UV rays with sunscreen, apply your favorite day cream to lock in all the moisture. 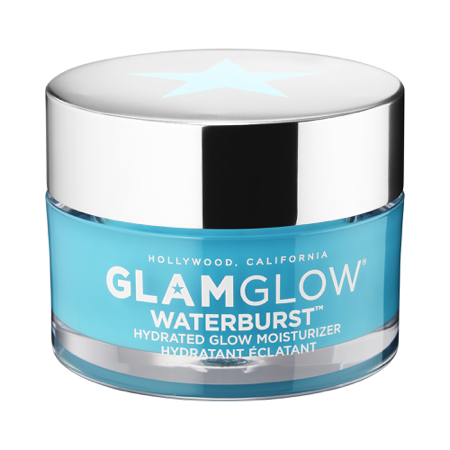 We just ordered the new GlamGlow daily moisturizer from Sephora! This gentle floral water revitalizes your skin, leaving it feeling moisturized and calm. We initially starting using this as a refreshing and moisturizing spritz when our faces felt dry, but we recently discovered all the other benefits of rose water. Rose water is packed with antioxidants and vitamins and has so many useful properties for skincare which you can read about here! Some include its ability to balance and cleanse oily skin as well as soothe irritated skin. We have found it to be such a refreshing addition to our travel routine. Not only do we find our skin has a nice dewy glow post-spritz, but rose water also has mood-enhancing properties which are perfect for combatting travel stressors. They don’t call it a red eye flight for nothing. Pack a bottle of eye drops. Not only does your skin get dehydrated during travel, but your eyes do as well which can cause you to rub them frequently (this causes more lines!). We also want to avoid putting our hands on our faces — or in our eyes — since traveling means you are surrounded by bacteria and germs. To keep our eyes moist we always have our Visine Dry Eye Relief in our carry-on; it is formulated to keep your eyes lubricated for up to 10 hours and works like a charm! This step in our travel routine makes us feel more awake when we land since we’re not struggling to pry our eyes open following a snooze in an over-air-conditioned cabin. We bring two kinds of creams for our eyes. The first one we bring along with us is The Ordinary Caffeine Solution. This reduces puffiness and dark circles and has a multitude of peptides, plant saccharides and active technologies. The other product we use is called Hylamide SubQ Eyes. This product provides intense hydration and care for your under eyes. It is a serious product that can tackle this big job! We apply before boarding the plane and depending on the length of the flight reapply during the flight. They are both in TSA approved sizes. Both are brands made by Deciem. We moisturize our lips with Sugar Advanced Therapy Lip Treatment. Fresh has some of the best beauty products and we especially love their lip formulas. Even their lipsticks are ultra hydrating! This lip treatment is fortified with sea fennel to help smooth the look of fine lines and wrinkles and define the lip area, while antioxidant-rich orange extract helps protect the lips. Please comment and share what you think about these products if you do end up trying them!! Or share any additional travel tips you might have with us!